Kosrae (pronunciation: koh-shy), formerly known as Kusaie, is an island in Federated States of Micronesia. The State of Kosrae is one of the four states of the Federated States of Micronesia, and includes the main island of Kosrae and a few nearby islands and islets, the most significant of which is inhabited (1,500 people) Lelu Island. Kosrae's land area is 110 square kilometres (42 square miles), sustaining 6,600 people. Tofol is the state capital. Mt. Finkol is the highest point at 634 metres (2,080 feet). Kosrae, the easternmost of the Caroline Islands, has a population of 6,616 (2010 census). It is located approximately 600 km (370 mi) north of the equator, between Guam and the Hawaiian Islands. It has a land area of approximately 110 km2 (42 sq mi). Some parts of the island are experiencing coastal erosion. Kosrae is a high island that is largely unspoiled. It is becoming a destination for scuba divers and hikers. The coral reefs that surround the island are kept in pristine condition through an extensive mooring buoy system, installed and maintained by concerned expat dive operators with the help of the government's Marine Resources office. The reefs are largely untouched, and contain miles of hard corals, some said to be thousands of years old. Dense vegetation and steep mountains keep the island largely undeveloped. Viewed from the ocean, the island's distinct shape resembles a female body. This has led to the island being called "the island of the sleeping lady." Kosrae International Airport (IATA code KSA) is located on an artificial island within the fringing reef about 150 metres (490 feet) from the coast and is connected to the main island by a new bridge that opened to the public in January 2016. It is served by United Air Lines (formerly Continental Micronesia) "Island Hopper" 737–800 flights (twice a week in each direction) between Hawaii and Guam, stopping at other FSM (Pohnpei and Chuuk) and Marshallese destinations on the way. Nauru Airlines also connect weekly with their fleet of 737–300 jets to Brisbane in Australia and Nadi in Fiji. There is one significant nearshore island within the fringing reef around Kosrae, which is Lelu Island, and it is only 2 square kilometres (0.77 square miles) in area, but with a population of around 1,500. It belongs to Lelu municipality, which includes the area around Tofol, the state capital. Other very small, uninhabited islands within the fringing reef are, Yen Yen and Yenasr (also in Lelu municipality), the airport island, Kiul, Mutunyal, Sroansak (Tafunsak municipality), and Srukames (also Tafunsak municipality, Walung part). The Kosrae Department of Education operates six public elementary schools (Tafunsak Elementary School, Malem Elementary School, Utwe Elementary School, Lelu Elementary School, Sansrik Elementary School, Walung Elementary School) and one high school (Kosrae High School). There is also one private school (Kosrae Seventh-day Adventist School). In July 2011, Kosrae DOE embraced the One Laptop per Child programme, distributing 720 "XO" computers to children in its public elementary schools, becoming the first State of Micronesia to do so. The official language of Kosrae is Kosraean, although the English language may also be used in government discourse. According to the Constitution of Kosrae, English is held to have "equal authority" to Kosraean (although in an instance where the Kosraean and English versions of the Constitution are held to be in irresolvable conflict, the Kosraean version prevails). However, the national language of the FSM is English. Archaeological evidence shows that the island was settled at least by the early years of the first millennium AD. This includes the city of Leluh that existed from about 1250 AD, and in its heyday had a population of about 1,500 and covered some 27 hectares. It featured burial pyramids for the nobility. The first recorded sighting by Westerners was by the Spanish navigator Álvaro de Saavedra on 14 September 1529 when trying to return from Tidore to New Spain. The island was under nominal Spanish sovereignty since 1668, but it was not effectively occupied until 1885. 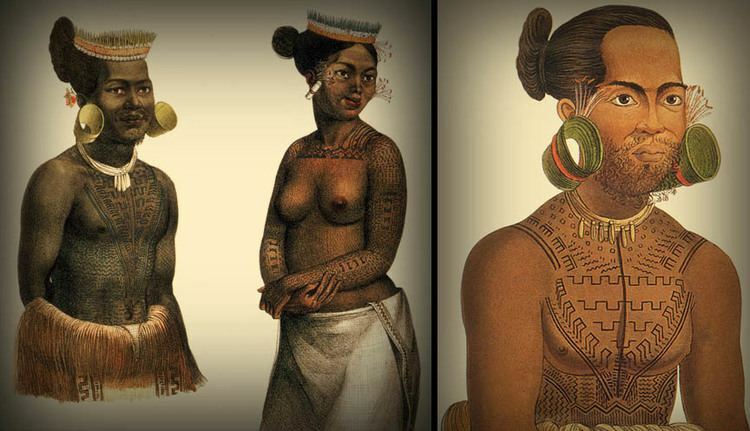 By the time of the island's first contact with European travellers in 1824, Kosrae had a highly stratified society, typical of the surrounding islands of the time. Its cultural features included matrilineal lineage and clans, with a feudal structure of "nobles" controlling land worked by "commoners" and settlements consisting of small groups of close relatives sharing a single cook house. The first missionary post was established by Congregationalists in 1852, and virtually the whole island had converted to Christianity by the 1870s. Today, many sects of Christianity are represented on Kosrae, and religion still plays an integral role in culture. The notorious captain and blackbirder Bully Hayes was shipwrecked on Kosrae on March 15, 1874, when his ship the Leonora was caught in Utwe harbor during a storm. Bully Hayes made his home in Utwe for seven months, during which he terrorized the local people. In September 1874, HMS Rosario (under the command of Captain Dupuis) arrived to investigate the claims against Hayes. He was arrested, but then escaped in a 14-foot boat, built of timber from the wreck of the Leonora. His treasure may have been left behind, buried somewhere in the forest, although subsequent diggings have failed to uncover it. The existence of this buried money is part of the myths that surround Hayes. In 1885, after a dispute between the Spanish Empire and the German Empire, finally resolved under the terms of the Vatican State, the Spanish Navy took effective control of the island. After the Spanish defeat against the United States in the war of 1898, on February the 2nd 1899 Spain sold the Carolinas Islands to Germany for 25 million pesetas (17 million German marks). The island came under the control of the Empire of Japan after World War I. Extensive economic improvements took place during the Japanese South Pacific Mandate of 1914 to 1945. The island was practically run by a few missionaries who converted the population; Willard Price, when he visited in the 1930s, reported that the island had no jail, there had been no murders in sixty years, and alcohol and tobacco were unheard of. The island was fortified by the Japanese during World War II, but no battles occurred on Kosrae. The Japanese garrison commanded by Lieutenant-General Yoshikazu Harada consisted of 3,811 IJA men including a company of tanks and 700 IJA men. Tunnel bunkers that have multiple entrances were dug into the island's interior peaks and most can still be explored today. In 1945, administration over Kosrae passed to the United States, which ruled the island as part of the Trust Territory of the Pacific Islands. Aid and investment increased from the 1960s. During the Trust Territory (TTPI) period, Kosrae was initially administered as one of the municipalities of the Ponape (Pohnpei) District, but in 1977 became a separate district. When the Micronesian constitution was defeated in the TTPI districts of Palau and the Marshall Islands, Kosrae joined the remaining districts (Yap, Chuuk and Pohnpei) to form the Federated States of Micronesia (FSM). Kosrae is the only single-island FSM state (whereby the seven or eight small nearshore islands within the fringing reef, most importantly Lelu Island, are subsumed under the main island), while the other three states are each composed of many islands. The number of municipalities has subsequently been reduced to four (by integrating Walung into Tafunsak). In early times, a system of exchange based on sea shells existed on Kosrae, although little is currently known about how it operated. Since the 1960s, the Kosraean government has become the main employer on the island, where fishing and traditional farming remain the main source of the islanders' subsistence. Imports have replaced almost all other native manufactures. The U.S dollar is the official currency used in Kosrae and throughout Micronesia. The tourism industry to date has mainly centered around scuba diving on the coral reef that rings the island. Surfing, hiking and stand up paddle-boarding through the extensive mangrove system is growing in popularity. The annual 10-kilometre (6.2-mile) Rockhopper running race commenced in 2013 and attracts several dozen competitors from the nearby islands of Kwajalein and Pohnpei. In July 2016, the Kosrae Nautilus Resort was won in a raffle promoted worldwide. The previous owners, Doug and Sally Beitz, were persuaded by family to conduct the raffle rather than sell the resort, ahead of returning to Australia. The winner, "Joshua", is from the state of New South Wales, Australia. Joshua will become owner of a resort, which is free of debt, profitable and has more than 20 years remaining on its lease. Traditional foods have included breadfruit, coconut, banana, taro, yam, and sugarcane. Breadfruit was the usual staple food, and it was preserved in leaf-lined pits for times of scarcity. Coconuts were reserved for nobles. Food was a central part of island life, since each settlement consisted of small family groups gathered around a cook house containing at least one earth oven. Soft taro was made into a feast food called fahfah by men trained in the elaborate skills needed to prepare it properly, who also prepared suhka (Kava). Brewed from the roots of a mountain plant, Suhka was served to members of the nobility. Fish were harvested mainly from the lagoon using nets. Today food for most families consists of imported rice and tinned meats and fish, combined with fresh local fish and root crops. Even today, fahfah and pork are considered mainly feast foods. It is thought that the Japanese introduced lime trees to the island, which now bear fruit almost all year round and are considered to be of high quality. A variety of tangerines, which are green when ripe, also abound, and are famous and sought after throughout the surrounding islands. Mountain apples, a tropical tree fruit unrelated to apples (Malus), are grown in many parts of Kosrae as are the delicious strawberry papayas and pineapples. There are many varieties of bananas that are some of the best tasting to be found anywhere, some that must be cooked before eating and others that can be eaten when still greenish (KALIFORNI). A few local farmers are growing and exporting to the Marshall Islands a variety of vegetables such as cucumbers, Chinese cabbage, lettuce, egg plant, squash, cantaloupe and watermelons. Kosrae State is subdivided into four municipalities. Of the originally five municipalities of 1980, Walung was subsequently absorbed by Tafunsak. The capital of the state is Tofol, in Lelu municipality.